BRYCE CANYON CITY — Ruby’s Inn – the closest lodging to Bryce Canyon National Park – is hosting the first “Canyon 2 Canyon” bike ride event Aug. 25-26. The event starts Aug. 25 with a free outdoor movie. 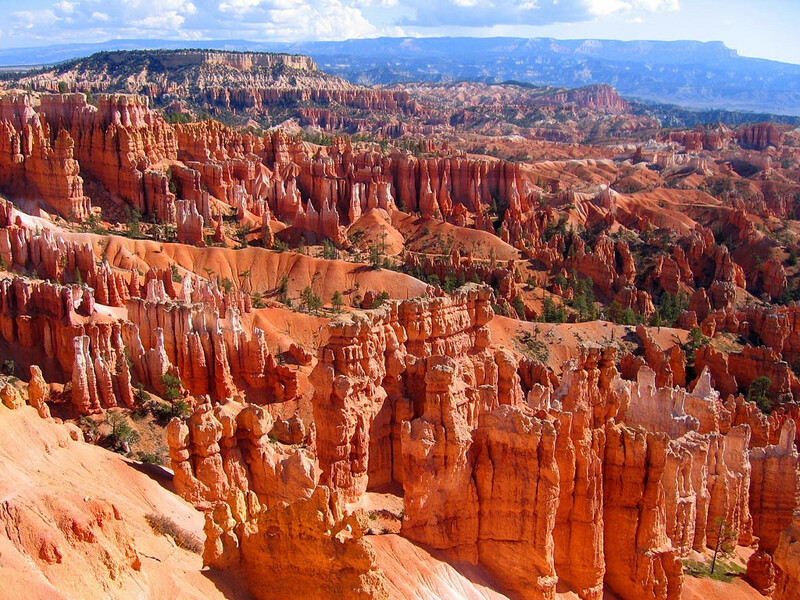 The free bike ride, between Red Canyon and Bryce Canyon, will be held Aug. 26 and includes beautiful scenery, vendors, games and more. Weather permitting, the event will close with a hot air balloon glow. Welcome and registration for the Canyon 2 Canyon bike ride starts Aug. 26 at 8 a.m., located at the parking lot next to the Ruby’s Inn shuttle building. Riders can leave at any time, but the first shuttle will depart for the starting point at 8:30 a.m. and will run every 30 minutes. The last shuttle and pick up will be at 2:30 p.m. Ruby’s Inn will provide a trailer to transport bikes. Riders can choose from three trials of varying lengths and difficulties. The longest trail, at 17 miles, runs from Inspiration Point in Bryce Canyon National Park to Red Canyon. The second trail, at 12.6 miles, begins at Ruby’s Inn and the third trail will start just 5.4 miles from the finish line in Red Canyon. The shuttle will pick bikers up at the bottom of Red Canyon. Along the trail, riders will find vendors and an interactive poker type game. Each rider will receive a card that will be punched at designated booths. After the ride, participates can turn the punch card in at the Canyon 2 Canyon check-in desk to draw playing cards for the chance to win prizes at the closing ceremony. The ceremony will be at 3:30 p.m. at the parking lot next to the Ruby’s Inn shuttle building. The registration for the bike ride is free and includes a T-shirt and admission for the poker ride. Riders who start at Inspiration Point will have to pay an entrance fee into Bryce Canyon National Park. Helmets and safety gear are recommended for all, but are required for children ages 10 and under. Deputies, search and rescue members, EMTs and troopers will be along the bike trail to assist in any way, and will be on site until 2:30 p.m. The free movie will feature “Movie at Rubys” and will start at 8:30 p.m. Aug. 25 on Ponderosa Lawn, across the street from the Sinclair. The event will close with a free balloon glow, weather permitting, from 8:30-9:30 p.m. at the shuttle parking lot. To register online and for more information about the event, click here. Bikers can also register the morning of the event at the check-in table. Since 1916, Ruby’s Inn has been making it easy for visitors from around the world to experience the epic scenery of Bryce Canyon National Park. Ruby’s Inn is located at the entrance to the park and offers the closest lodging with everything from luxury hotel rooms to RV parks and campgrounds. Ruby’s Inn is open year-round and has exclusive access to canyon overlooks for horseback riding, ATV riding, horse-drawn sleigh rides and snowshoeing. The Ebenezer’s Barn and Grill entertains crowds nightly from April through October with a western dinner show and cowboy grub. The General Store provides fuel, groceries, camping gear, clothing and souvenirs. To plan a vacation, visit Ruby’s Inn online or call 1-866-866-6616. What: “Canyon 2 Canyon” bike ride. When: Saturday, Aug. 26, 8 a.m. | A free movie night will take place Friday, Aug. 25 at 8:30 p.m.
Where: Bryce Canyon Ruby’s Inn, 26 S. Main St., Bryce Canyon City. Register: Online or at the check-in table on the day of the ride.